If you love Nutella and chocolate chip cookies, these cookies have you covered. 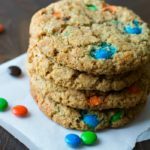 My daughter loves both so we decided to make these gluten free Nutella stuffed chocolate chip cookies so we didn’t have to make two different cookie batches. Okay, who are my Nutella fans? Nutella is a hard to resist combination of chocolate and hazelnuts. It is whipped together until it is smooth and creamy. One of these days I am going to make my own…but until then, it is easiest to buy at the store. Our family definitely has a love affair with Nutella. It is rare for me to buy it because it doesn’t last long enough for me to make a recipe with it. That takes the fun out of it a bit for me. 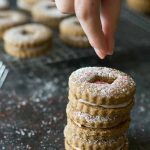 I did make these Gluten Free Nutella Linzer Cookies a few times, but that is it. I don’t have a plethora of Nutella recipes for you, and for that, I am sorry. I know you have a sweet tooth like mine. (And if you are wondering how I know you so well, 9 of my top 10 most popular recipes from 2016 are sweets!) The good news is you can make this Nutella stuffed cookie recipe any time you want! 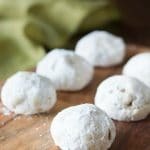 Are you ready to see how easy it is to stuff cookies? The first step is to mix your ingredients following the recipe directions. Next, use a cookie scoop to drop the dough onto a baking sheet. Push in the middle to make an area for the Nutella. Drop some Nutella into the cookie dough hole. How much Nutella you use will depend on your cookie scoop size and the hole size. 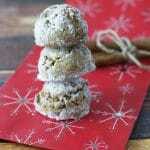 Cover the Nutella with more gluten free cookie dough. Smooth the edges so that no Nutella is showing. The gluten free chocolate chip cookies are now ready to bake! 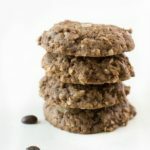 Are you ready to take a bite of these gluten free chocolate chip Nutella cookies? I know I am!! A cookie scoop helps keep your cookies all the same size. These easy gluten free Nutella stuffed chocolate chip cookies are so fun to make. In a smaller bowl, add all wet ingredients (EXCEPT Nutella) and whisk to blend. Pour the wet ingredients into the dry ingredients. Add chocolate chips. Mix well. Use a small spoon to hollow out the centers of each cookie. Add Nutella to each indention. 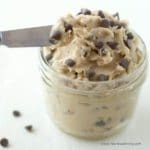 Top the Nutella with a little bit of cookie dough. Press to seal the edges around the Nutella. Remove and cool on a cookie rack. My son is the Nutella lover in the family. I’ll have to make these for him. Or better yet, give him the recipe! These cookies look amazing….and then to bite in and find Nutella!!? Such a yummy treat! I could go for about a dozen of these! I will have to make another batch then :-). give me all the nutella! these look so insanely delicious! Wow these cookies are fantastic!! My kids would LOVE them!! I’m pretty sure that these are a must have….They look divine! Hi Adrienne, My cookie recipe is pretty standard. Honestly, you can use any gluten free cookie recipe and stuff the Nutella inside. Tell you son that my kids devoured these. The idea came from my daughter, who begged me to buy Nutella last week. Take care. These are just PERFECT! We’re huge Nutella fans, and the fact that you stuffed it into chocolate chip cookies? SWOON. Thank you so much Erin :-).